2016 is year of career anniversaries for Gretchen Peters. 1996 saw her first make the step from songwriter to recording artist and also when the UK appeared on the horizon as a potential outlet for her brand of stylish and smooth lyric-driven songs. To mark this milestone, Gretchen is set to undertake yet another extensive tour of our towns and cities, this time fully armed with her most comprehensive collection of reflective material to date. 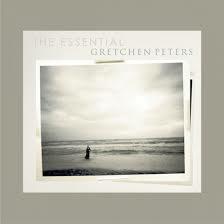 THE ESSENTIAL GRETCHEN PETERS is a brash title, but throughout this twenty-seven track two-CD production the quality is soaked right through to the core as a serving of the familiar and not so familiar aches to be indulged by the critical ear. Back in 2009, a ‘Best of’ album did hit the market, but that statement was rendered obsolete when Gretchen’s recording career soared with the subsequent records HELLO CRUEL WORLD and BLACKBIRDS. As you would expect, several key tracks from these releases appear on ESSENTIAL alongside those chart heyday cuts dating all the way back to 1991 with ‘Chill of an Early Fall’. What also adds to the appeal of this collection is Gretchen’s desire to mix the selection up with demos, bonus tracks, work tapes, live versions and straightforward recorded material, as well as a beautifully constructed acoustic version of the classic ‘Independence Day’. The personal conundrum for retrospective collections is to evaluate their motive and highlight the target audience. On a positive front there does not appear to be an industry trait of tagging a focussed new single to force the hand of fans. While Gretchen devotees will without doubt snap this album up and savour the formatted offering, on the other hand full respect must be honoured to those who already own a vast majority of the tracks in a variety of formats and may choose the cherry picking option available in this digital age. However, this collection is heaven sent for Gretchen newbies, although it should only act as a taster before diving head first into the complete albums. Collections should never detract from this notion and be only curated to find their niche. Returning to the theme of anniversaries, this new record will be released almost a year on from her most successful album to date BLACKBIRDS and there is certainly commercial merit in capitalising on this bout of wider appreciation. The upcoming tour represents the tenth anniversary of me seeing Gretchen play live in the UK and the evolution of her Midlands dates was capped with a performance at Birmingham Town Hall on the most recent full length tour. Since catching Gretchen live for the first time at The Robin in Bilston, her stage show has progressed from initially solo performances, through the Barry Walsh duo sets, those fun nights with Suzy and Matraca, the addition of Christine Bougie and the culmination of the four piece band for last year’s dates. Whatever the format, each show has sealed the appreciation deal with the bonus on this new collection being a live version of ‘Woman on the Wheel’ and a recording of ‘Wild Horses’ with her dear Wine, Women and Song friends. While on the subject of the last song, it would be remiss not to recall the duet Gretchen sang with Otis Gibbs at the Maverick Festival a few years ago with the infamous peacock backdrop. From the tracks that may not be so familiar, the previously unreleased duet with Bryan Adams ‘When You Love Someone’ will raise eyebrows. Just to re-enforce the fact that Gretchen can be a great interpreter of songs, she has included John Lennon’s ‘Love’ and a version of the timeless standard ‘When You Wish upon a Star’. However the jaw dropping surprise moment of the record is a wonderful rendition of the traditional favourite ‘The Cruel Mother’, which had only appeared before as a bonus track on BLACKBIRDS. A couple of songs do feature twice with the work tape takes of ‘Blackbirds’ featuring its co-writer Ben Glover and the increasingly viewed masterpiece ‘Five Minutes’, this time without the impeccable timing of the album version. For those who have closely followed Gretchen’s career, and its consistent upward trajectory, there is a temptation to bracket the title of this album as ‘interim’ as surely there is much more to come thus consigning the term ‘Essential’ to the same obsolete status as 2009’s ‘Best of’. 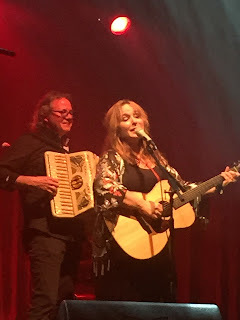 However life is best lived in the present and THE ESSENTIAL GRETCHEN PETERS is the perfect snapshot of where this much loved artist is in 2016. Let’s just call it a celebration and much deserved acknowledgement of a singer-songwriter who has done so much to entwine the country, folk and Americana genres over the last couple of decades.